The Wismec Reuleaux range helped shape and redefine sub-ohm e-cig kits. With its balance of refinement and performance, the Reuleaux RX GEN3 Dual is the culmination of features from the RX range. For a dual 18650 battery mod it is extremely compact, packing plenty into its ergonomically designed form, featuring a 1.3inch monochrome OLED screen, up to 230W of power and housing dual 18650 batteries. Wismec has taken all experience gained through the RX heritage and created its pinnacle, the Reuleaux RX GEN3 Dual. It cannot be topped, so will be the last ever ‘Reuleaux’ mod released. Eleaf has designed this vape mod with a massive 5000mAh internal battery capacity, meaning it will last much longer, along with up to 80W output and user features you’d expect such as temperature control. 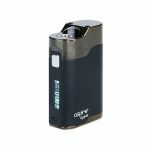 This is another Eleaf mod in a long line of popular and reliable devices by this leading manufacturer, and because of the built-in battery you don’t need to buy batteries separately. Considering the battery capacity, it’s reasonably lightweight and it’s sleek and compact in design.